Bionic Briana: A life lesson learned at work. A life lesson learned at work. I've been thinking a lot about this particular topic lately and I've been meaning to share my thoughts for awhile because 1. I hope it will help whoever is reading this realize the preciousness of life, and 2. Maybe it will help me gain new perspective on what I do everyday. I work in an ICU... we specialize in three different types of patients - surgical patients, which can be anything from total gastrectomy patients to liver/kidney/pancreas patients. Next we have the dreaded neuro patients, which isn't really any one's favorite type of patient but that's a whole 'nother blog - these patients are in the ICU for brain hemorrhages (i.e. strokes), head trauma... basically anything that has gone wrong with the brain. 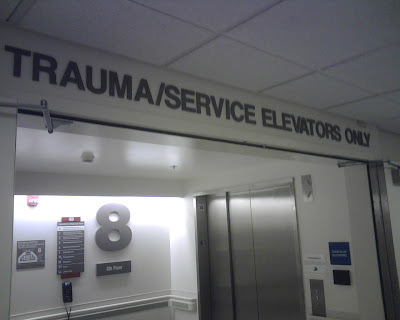 Lastly, and this may sound macabre, but mine and most of my co-workers favorite type of patients are trauma patients. The title "trauma patient" needs no explanation and I can speak for most of my co-workers that we all sort of love getting trauma patients because they can be very sick and very unstable and very bloody. I know, we're a weird bunch of like-minded people. So without going into too much detail to respect the privacy of the patient and keep from grossing anyone out, we had a 'pretty bad trauma,' as we call it, the other night.... motorcycle versus automobile. Obviously the guy on the motorcycle was our patient and the driver of the car was pretty much unscathed physically. I don't get why ANYONE would be dumb enough to drive a motorcycle PERIOD let alone in Los Angeles but this young guy in his 30's unfortunately had an altercation with a car and the car won. To make a long story short, he came to our ICU completely unstable, we 'coded' him for an hour or two (which, if you watch any medical shows you know what that means) and, in the end, he didn't make it. It was a bloody mess, to say the least, but I won't go into specifics. The point of my blog is this.... when we get trauma patients that don't make it, it always gets me thinking: This particular motorcyclist woke up that morning, had breakfast, maybe kissed his significant other goodbye, went about his day.... and BAM!! Dead by midnight. The finality of it is sometimes mind-boggling for me. Sometimes it doesn't seem real.... like the reset button will be pushed and the guy will be alive and okay. And then to see the devastation of the family is always difficult, especially with someone so young. The contrast between the outpouring of grief from the families and us taking it in stride as part of our job seems disharmonious... but it is part of our job and we do see it on a regular basis and I think I need to better learn how to take it as such. I don't want anyone to get the wrong impression and think that we are callous in these situations or with these people but I think it's human nature to be somewhat disconnected as sort of a self-preserving mechanism... at least for a 'greenie' new grad like me. We see death all the time in the ICU and it's not always traumatic like in this case. Sometimes it is a good and happy thing because the patient that had no chance of recovery is no longer suffering. In those instances, the family and often times the patient, have known that death was soon approaching and they (and the nurse!) are better able to prepare themselves emotionally for when it happens. I think what I am trying to say is, watching and experiencing the harsh and unexpected death of trauma patients has helped me realize that what I consider to be 'problems' in my life are actually pretty insignificant and totally manageable. It has helped me to be more careful but also to take life less seriously... to enjoy the simple things... to take life more slowly and to live and be 'present' in the moment rather than worrying about what is coming up next week or what happened two days ago. This is my life right now. This very second. And, like the guy on the motorcycle, it could be taken away in the blink of an eye. This is it. There is no reset button on life. I try to remember that when something seems too big, too stressful, or too unmanageable. In the grand scheme of my life, as short or as long as it may be, I know I will be glad that I spent as much of my time enjoying life rather than stressing over what is oftentimes out of my control. I challenge anyone reading this to do the same. Yeah, that's good advice. Life is fleeting. We never know if we're going to die that day. Makes me think twice about letting Evan leave for work when we're fighting. Love this blog. I agree completely. You are a great writer by the way. Wish I could have seen you when you were here. Also, I won't be joining you for the race, but I hope to do it in the next couple years, after I finish my birthing stage in life. He!He!